NZD has been under the influence of technically oversold conditions and an upbeat RBNZ Financial Stability Report and friendly remarks from RBNZ Governor Spencer. 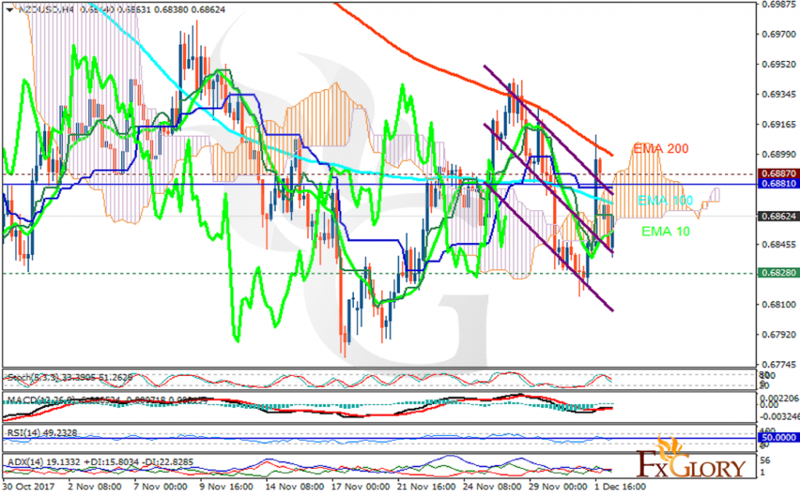 The support rests at 0.68280 with resistance at 0.68870 which the weekly pivot point at 0.68810 is located in between the lines. The EMA of 10 is moving with bullish bias in the descendant channel and it is below the EMA of 200 and the EMA of 100. The RSI is moving on the 50 level, the MACD line is above the signal line in the positive territory and the Stochastic is showing downward momentum. The ADX is not showing any clear signals. The price is in the Ichimoku Cloud and above the Chinkou Span. The Tenkan-sen is showing a downward trend while the Kijun-sen is showing a horizontal trend. Short positions are recommended towards 0.679.